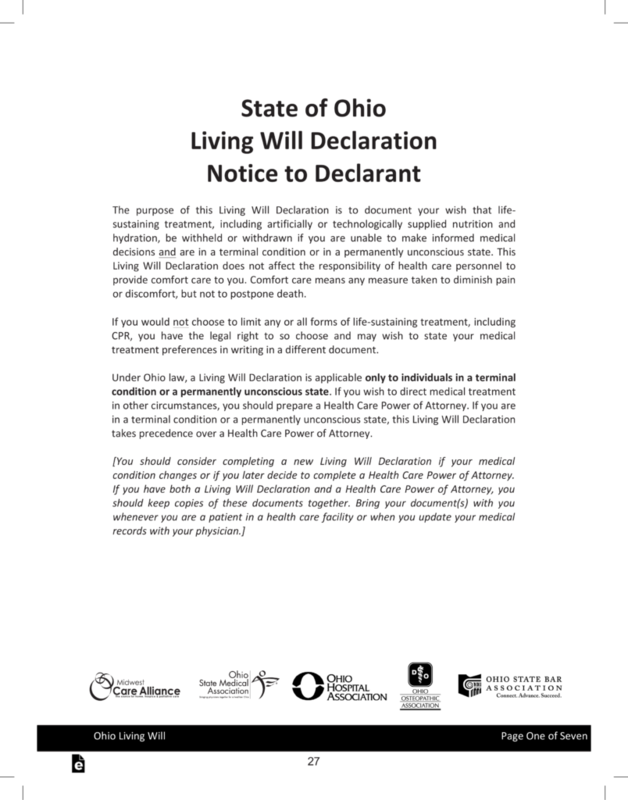 The Ohio Living Will Declaration, which may also be known as an ‘Advance Directive’, allows a person to specify their own wishes and desires with how they would like their medical team or their Attorney in Fact/Agent to be honored. The document will provide specific instructions with regard to how the Declarant would like to be treated when their are no other medical options for them to recover to an acceptable (to the Declarant) quality of life. Medical Power of Attorney – Request an agent through this document to have someone else make decisions on your behalf in the chance of a coma, vegetative state, or any mental impairment. Step 1 – Download the document. The Declarant/Principal must carefully read the section located on the first page of the document, so that they may be better informed regarding what to expect by completing this document. The Declarant should take the time to review the definitions that will be found throughout the document. You may refer back to them at any time if you need to be clear. If at any point this document becomes overwhelming or you do not understand, consider a consultation with an attorney. Take no action to postpone my death, providing me with only the care necessary to make me comfortable and to relieve pain. If the Declarant prefers a Notary Public as witness, the notary will complete the remainder of the document and acknowledge with their state seal. 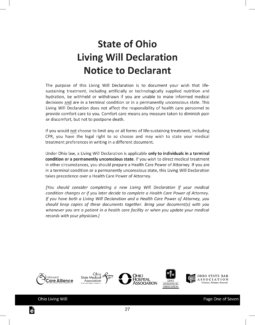 Step 10 – State of Ohio Donor Registry Enrollment Form Notice to Declarant – If the Declarant would like to be an organ donor you must read the following and then complete the form.